Jeremy Corbyn has accused the Conservatives of planning another five years of austerity to pay for tax handouts for the wealthy if they win the General Election on June 8. "Now the Conservatives want five more years of cuts to our vital public services to fund tax handouts for the wealthy few. Labour will make very different choices," he said. Representing the Conservatives after Theresa May rejected Mr Corbyn's challenge to take part in the seven-way debate, Home Secretary Amber Rudd accused the opposition parties of offering "bluff, bravado and tempty, shiny election promises". "The only question to consider is who should be in No 10 to steer Britain to a brighter future? Jeremy Corbyn with his money tree, wish list manifesto and no plan for Brexit or Theresa May with her record of delivery," she said. Alongside Labour leader Mr Corbyn and Ms Rudd on the stage in Cambridge were Liberal Democrat leader Tim Farron, Ukip's Paul Nuttall, Green Party co-leader Caroline Lucas, Leanne Wood of Plaid Cymru and Scottish National Party depute leader Angus Robertson. Ms Wood opened the debate with an attack on the Prime Minister for refusing to take part. "Theresa May called this election because she is taking you for granted. She won't turn up to these debates because her campaign of soundbites is falling apart," she said. She added that Labour in Wales was "airbrushing" Mr Corbyn out of its campaign and pleaded with voters to give her a mandate to represent the Welsh. For Ukip, Mr Nuttall began with a pledge to "put the interests of British people first" by boosting social care and wages and slashing immigration and the foreign aid bill. SNP Westminster leader Mr Robertson said his party would hold the Tories to account on Brexit, welfare and protecting public services, and vowed to offer "a strong voice for Scotland" in Westminster. He said: "A vote for the SNP is a vote against Tory cuts that will harm our public services and push many more hard-working families into poverty." Mr Farron kicked off with a jibe about Mrs May's absence, saying: "Where do you think Theresa May is tonight? Take a look out your window. She might be out there sizing up your house to pay for your social care." The Lib Dem leader took aim at Tory plans for social care, school lunches and Brexit, while offering to shore up the NHS and allow the public to have a vote on the Brexit deal. Mr Farron said: "Look, I know we don't all agree on Brexit but she is off to negotiate a deal for you, for me, for all of us. Imagine if it's a bad deal. I mean dementia tax bad." 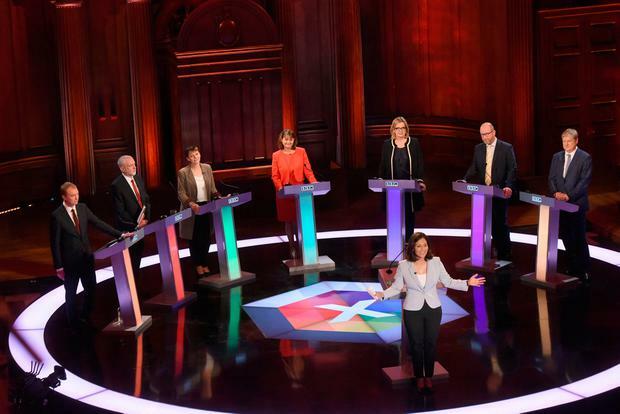 Ms Rudd dismissed her rivals' claims as "fanciful" and warned their spending plans would require a "magic money tree" as she came under attack over the squeeze on living standards and cuts to welfare as the debate heated up. Mr Corbyn told her: "Have you been to a food bank? Have you seen people sleeping around our stations? Have you seen the levels of poverty that exist because of your government's conscious decisions on benefits?" The Labour leader highlighted his plans to end the public sector pay cap and introduce a £10 an hour living wage by 2020. Mr Robertson claimed the Tories had "chosen to support those who are wealthiest in society" but said the SNP would put up the top rate of tax from 45p to 50p. He said it was time to stop "punishing disabled people" and scrap the so-called bedroom tax. Ms Rudd said the Tories had taken low earners out of income tax and had increased the amount of money paid out in disability benefits. But she stressed: "We are going to live within our means. Some of the offers you will hear tonight are just fanciful." A strong economy was needed - which required a successful Brexit deal, she said. Ms Rudd defended the Tory record on welfare, insisting: "We are a party who will always support those in most need." The welfare bill for helping people with disabilities had increased £7 billion to £50 billion in the last seven years, she said. In an attack on Mr Corbyn she said: "I know there is no extra payment you don't want to add to, no tax you don't want to rise." She added: "We have to stop thinking, as you do, that there is a magic money tree." Ms Lucas said Ms Rudd's response on disability benefits was "downright insulting". Mr Corbyn also clashed with the Ukip leader over corporation tax, insisting it was "complete nonsense" to warn that Labour's plans to hike the levy could put jobs in jeopardy. Ms Rudd said Labour's spending plans did not add up and accused Mr Corbyn of playing games with people's money. "It's as though he thinks it's some sort of game - a game of Monopoly perhaps where you ask the banker for the red money to pay electrics, the green money to buy the railways and the yellow money to buy the gasworks," she said. "It's not like that. This is people's hard-earned money. We will protect that. We won't roll the dice." On immigration, Mr Nuttall said current levels were "unsustainable" and that Ukip would take action to bring the numbers coming into the country under control. "We would do it by having an Australian-style points system so that if you've got the skills this country needs, yes, please come here and work, but beyond that we have to get the population under control," he said. Mr Farron accused the Conservatives of running an immigration policy to "appease Ukip", and drew applause when he highlighted the case of an Asian doctor who was spat at and abused as he returned home after treating the injured in the Manchester bomb attack. "That is what happens if you demonise immigrants," he said. "Do we need, as I'm afraid the Prime Minister has done for the last seven years, to set completely barmy, bogus targets that she fails to meet every year. No we don't." Ms Rudd said that once Britain was outside the EU they would be better able to control the numbers. "We have said we will continue to reduce those numbers. As we leave the European Union we will have more chance to do that and to be able to decide who comes to this country," she said. Mr Corbyn said Labour would pursue a "fair" immigration policy but refused to be drawn on the numbers they would allow to settle. "Fair is where you bring people in when they have got jobs to come to or it is necessary for them to be working here or we need them to assist in the economy. That is fair," he said. Ms Wood received a round of applause from the audience when she accused the party of using Brexit to "whip up people's hatred, division and fear". She said: "Ukip has just claimed that people voted to leave the European Union and in so doing they also voted to curb immigration. "I don't think we can read that into the result." Hitting back, Mr Nuttall said the issue was about government policy rather than racist ideas, adding that his party was the only one that would cut immigration, which he claimed was a key factor in the Brexit vote. Mr Robertson intervened, saying the level of debate "shames and demeans us all", as he outlined how Scotland's problem was people emigrating rather than immigration. The SNP depute leader said: "I don't think there is anyone in this room, or anybody watching this debate from Cornwall to Caithness who does not understand the positive contribution that people have made to this land who have come from the rest of Europe and the rest of the world and demonising those people is totally unacceptable." Mr Robertson led calls for ministers to guarantee the rights of EU nationals living in the UK, while the Green leader said the failure to do so was "unbelievably cruel". Ms Lucas said Britain should be a "confident, outward-facing country" that recognises the positive contribution of migrants who are more likely to be NHS doctors than ahead in the queue, she said. Mr Corbyn was challenged for "aping Ukip" over Brexit by the SNP depute leader, who said the party should be fighting to remain in the single market after Brexit. Accused of treating EU citizens as bargaining chips, Ms Rudd said the claim was "absolutely untrue" and insisted a deal would be done when the Government was assured of the rights of UK nationals living in Europe. Ms Rudd tried to use the heated debate to warn over a "coalition of chaos" between the other parties after the election, but she was shouted down by Ms Lucas, who said the public had more to fear from a coalition between Ukip and the Tories. Mr Robertson, Mr Corbyn and Mr Farron piled into Ms Rudd over the Tory manifesto policies on social care and the winter fuel payment, demanding answers on who would lose out from the reforms. The Home Secretary was laughed at by the audience as she called for people to "judge us on our record" on the public finances. "We have cut the deficit, we have reduced taxes for the lowest paid and we have made sure that we have continued to invest in the NHS, which is getting another £8 billion a year by the end of this parliament," she said. But the only way to have the money to invest was through having a strong economy "which does sometimes mean making difficult choices, those sorts of choices no other party here is prepared to face up to". She added: "The sure way to bust our economy, to lead to danger, is to have false negotiations with the EU, to have the sort of leader - like Jeremy Corbyn, supported perhaps by the people here - who would create just confusion when trying to deal with the 27 different states." Mr Corbyn said Labour would negotiate tariff-free access to the single market to protect manufacturers. He added: "Our schools are underfunded, our hospitals are overcrowded, our students are saddled with debt, there's a growing housing crisis. "At every single turn, their answer is to further reduce corporation tax and further reduce tax for the very wealthiest in society." Mr Robertson began the attack on Ms Rudd over pensioner benefits and the social care "dementia tax", telling her "I think those people deserve to know by how much" they will lose out. "The Prime Minister didn't have the guts to come along this evening to tell us," he said. The Tories have vowed to means-test the winter fuel payment, but have not set out how many older people would continue to receive the benefit, worth up to £300. The Conservatives have also said they will consult on a cap on social care costs, but will not reveal further details until after the General Election. Ms Rudd said the plans would mean winter fuel payments will not be paid to millionaires but would not give specific figures. She added: "We will always look after pensioners, ensuring they have dignity and security in retirement." Mr Farron said: "What we have is a General Election in eight days' time, Theresa May assuming a colossal landslide - that's why she thinks she can ignore you and not bother turning up tonight - and she's telling you 'we will take your house off you and we will allow you to know how much we will let you keep after you have given me a colossal majority'. "If tonight you resolve to vote Conservative on June 8, you are resolving to give Theresa May permission to do what she likes. "That's with education cuts, that's with NHS cuts. Do not give her a blank cheque." On terrorism, Mr Corbyn said that British military intervention in countries such as Libya had left "ungoverned spaces" which the extremists had been able to exploit to mount attacks. "If you intervene somewhere, the consequences go on for a very long time," he said. "It would be extremely unwise for any government anywhere in the world to ignore what is happening in Libya, where large areas are left ungoverned and very dangerous forces are arising there. "What we need to do is recognise the human rights and justice for people all around the world and be prepared to support them, not just go in and bomb and do nothing about it afterwards, which is what happened in Libya." He was attacked by Ms Rudd for consistently failing to support anti-terrorism legislation throughout his time in Parliament. "We have to make sure we have the right legislation. I am shocked that Jeremy Corbyn just in 2011 boasted that he had opposed every piece of anti-terror legislation in his 30 years in office," she said. "I really think he must be held accountable for that because I find it chilling." "My opposition to anti-terror legislation isn't opposition to protecting us from terrorism. It is simply saying there must be judicial oversight over what is done in our name," he said. Challenging the Home Secretary on why the UK was the world's second-biggest arms dealer, including selling to Saudi Arabia, Ms Lucas added: "I don't know how you sleep at night." Ms Rudd refused to apologise for defending the UK and vowed to ensure armed forces and security services were properly funded. On tackling extremism, Ms Wood said cuts to the numbers of youth workers had made Britain "less safe" as there were fewer people to challenge extremism in young people. Mr Nuttall said radical Islam was "a cancer that needed to be cut out" to prevent other attacks. Asked whether he would lock up suspected terrorists without trial, he said: "I've said nothing should be taken off the table. "As far as I'm concerned, when MI5 tell us there are 23,000 jihadis out there who want to do us harm, I will always put British lives over the human rights of any jihadi any day." He was attacked for "going straight for Muslims" by Mr Robertson, who prompted applause when he pointed out that a white neo-Nazi was responsible for the murder of MP Jo Cox. Mr Corbyn said he "utterly deplored" the language Mr Nuttall used, to which the Ukip leader retorted: "You invited Hamas to the House of Commons." Moving on to the environment, Mr Farron said climate change was the greatest threat facing the world and called for a global effort to tackle the problem. Mr Farron said that in countering terrorism, the UK needed to stand alongside other countries that shared the same values. "That will mean all sorts of things but sometimes it will take real serious action. Sometimes it will even mean military action. You have to do the tough thing to defeat the terrorists," he said. Mr Nuttall said that while the UK's interventions in Iraq and Libya were "fundamentally wrong", they were not to blame for what happened in Manchester. "What politicians need to do is at least have the courage to name what it is. It is Islamist extremism. Nobody seems to have the courage to say what it is," he said. His remarks were condemned by Ms Lucas who said: "The kind of response we have just heard from Paul which seems to suggest the violence in Manchester is somehow representative of Islam is completely outrageous." Ms Rudd, a former energy and climate change secretary who helped negotiate the Paris deal, said it was "disappointing" that the US administration was pulling out. Ms Wood told her to "tell him he's wrong", but the Home Secretary said: "That's not quite how diplomacy works." While the other politicians criticised Mr Trump's stance, Mr Nuttall said: "He is putting America first and frankly I think Britain should put Britain first as well." As the discussion turned to the issue of leadership, Mr Corbyn said: "It is leadership to lead a government that is prepared to say to our society 'we cannot go on like this'. "We have to start putting more money into our public services and our resources, we have to have an economy that works for all and we don't have to have a spiv economy that hands tax relief to the biggest corporations and the wealthiest people while ignoring the desperate cries for social help of so many people in our country." Mr Nuttall said "I don't flip-flop" and he was a principled Brexit supporter, vowing to oppose paying a divorce bill to Brussels. Ms Wood shot back: "Would you refuse to pay your dues if you were going through a real divorce?" Ms Rudd defended the Prime Minister, saying Mrs May would be able to handle Brexit because her party supported her, unlike Mr Corbyn. "How can he go in to negotiate with 27 different countries with such a weak team and weak support behind him?" The other politicians again hit out at Mrs May's absence, with Ms Lucas saying: "The first rule of leadership is to show up." Mr Farron said: "How dare you call a General Election then run away from the debate." Mr Robertson said "weak and wobbly" Mrs May was "not so much the Iron Lady as the U-turn Queen". Asked why Mr Corbyn did not mention Mrs May's absence during the debate, a Labour source said: "May's absence spoke for itself. If she won't debate, how can she negotiate? "There was only one future Prime Minister on the stage and Jeremy used the opportunity to lay out our plans to transform Britain for the many not the few." As the debate drew to a close, Mr Nuttall sought to hammer home Ukip's position, saying: "We have been proven right on Brexit, proved right on immigration, proved right on grammar schools, proved right on protecting our police and security services." Ms Lucas, in her closing remarks, said Britain was at a crossroads between tolerance and openness or turning inwards towards "isolation and hate". She said: "One more MP for the other parties makes no real difference but more Green MPs will be truly transformative." Summing up, Mr Corbyn said the "real choice" facing Britain was between Labour and the Tories, whether for the many or the few. Ms Wood said the party would stand up for the whole of the UK and would ensure Wales was not "invisible" in the UK. The audience clapped and cheered when Mr Farron told them the Prime Minister "can't be bothered" to turn up and told them to switch over to the Great British Bake Off. He added: "You're not worth Theresa May's time. Don't give her yours." The final comments came from Ms Rudd, who sought to point out the strength and consistency of the Tories in the face of Brexit. She said: "You have heard the squabbling and discord of disagreement here tonight. "You have seen the coalition of chaos here in action but in the quiet of the polling booth you have a clear choice. "A vote for anyone other than Theresa May is a vote for Jeremy Corbyn and that coalition." The audience was selected to be representative of British adults according to their politics and the way they voted in the EU referendum. But Mr Nuttall indicated that he thought they were too left-wing, comparing them to the Corbyn-supporting Momentum group. On Twitter he joked: "Enjoyed tonight's debate - particularly having the chance to speak to Momentum ... Oh sorry I meant the audience."